Pen and Paper: RAGS TO RAGS. Cas Amato is a first time author. He is not a celebrity, not rich nor otherwise extraordinary. He is just an ordinary guy, living an ordinary life, and yet, he decides to write his autobiography. Initially, he wonders why he is doing it, and who could possibly be interested in reading such a work. Nevertheless, he sits down and completes his story, concluding that it is there to be written, so why not just do it anyway. His family may think he's nuts, but that has never stopped him in the past. The end result is a rather quirky and tongue in cheek account of his life, his Italian culture, his successes and failures, and his travels, which have taken him to the far ends of the earth and back. To you, the reader, for what you are about to read, I thank you, and can only hope that this will be an interesting and pleasant experience for you. MY THOUGHTS ... What a joyously nostalgic read. Yes, I too remember the days when all we had were three channels to watch. 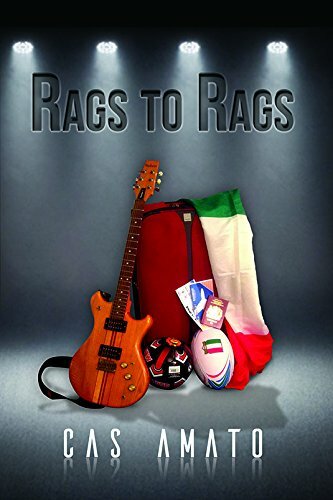 It's true, you probably won't have ever come across the author, he isn't a celeb, just a normal guy with a story of everyday life - his life, the son of Italian immigrants, growing up in late 1960's England - to tell. Quirky definitely. I'm very much of the opinion that the author is one of life's story tellers. Rambling, yes. But somehow this only adds to the overall appeal, the spontaneity making it all the more natural; like having a good reminisce over a cuppa with an old friend you haven't seen in a while. I'm not sure what to think about this one. Part of me applauds Cas's drive and tenacity in documenting his life so publicly. The other half of me is left wondering why, if Cas has done it, shouldn't we all make public the diaries of our lives, for all to see and I'm not sure that I personally like the idea of that. Having said that, I am not a big fan of biographies in the first place and to have a true life story of an 'ordinary' presented to me, might be infinitely more interesting than the drivel some of the so called 'celebrities' manage to churn out. This sounds nice and nostalgic. Terrific review, Tracy! Oh nice. I would have thought the rambling would end up distracting you but if it works for the book it makes me curious. Brilly review. This sounds delightful. Maybe we really do all have a story inside us, waiting to be told. Greetings Tracy. Thank you for the review, it is appreciated. I don't often read autobiographies. Glad you enjoyed the read. Blessings to you. Love love, Andrew. I also remember having only three channels to watch. lol Lovely cover. These are my favorite kinds of memoirs. Ones about ordinary people, not celebs or those with fame to claim.